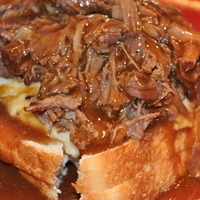 Make Gravy separately to pour over bread, meat and potatoes. Combine all of the above in a crock pot and cook all day. Take meat out of pan and skim off all the fat. Shred the meat and put back in pan with the juices that are left. Prepare the gravy and potatoes. Layer 2 pieces of white bread on top of each other, cut on a diagonal. Spread a heaping spoon full of potatoes across the bread. Top with a ladle of the meat and drizzle plenty of gravy on top.